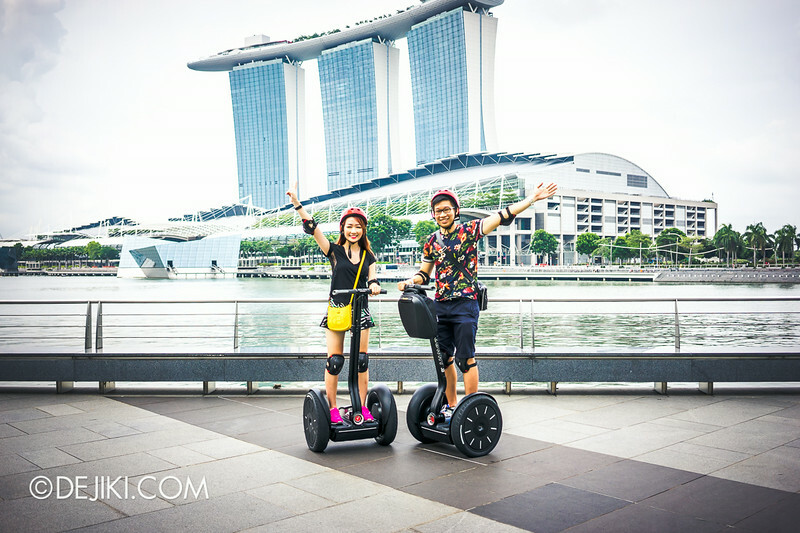 Discover Singapore’s iconic waterfront with high-tech personal transporters! 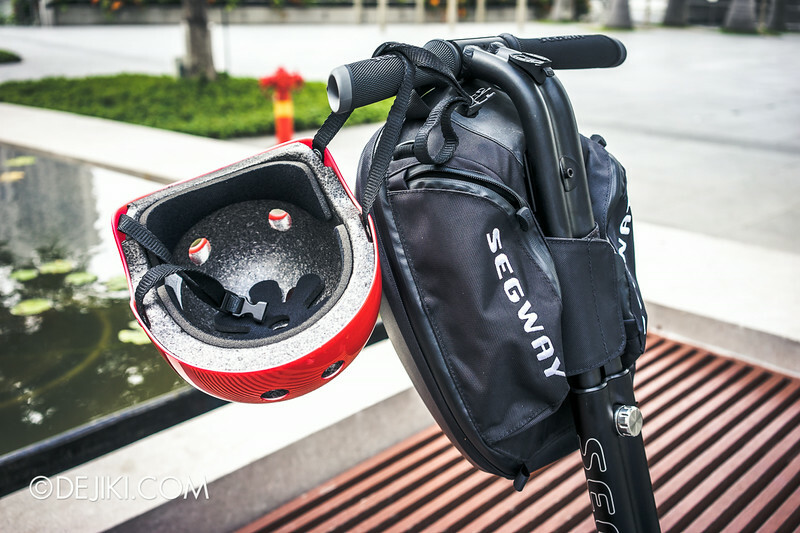 We had our first experience zipping around Marina Bay on the Segway Personal Transporter (PT). It was part of the The Signature Marina Bay tour by Segway Tours Singapore. 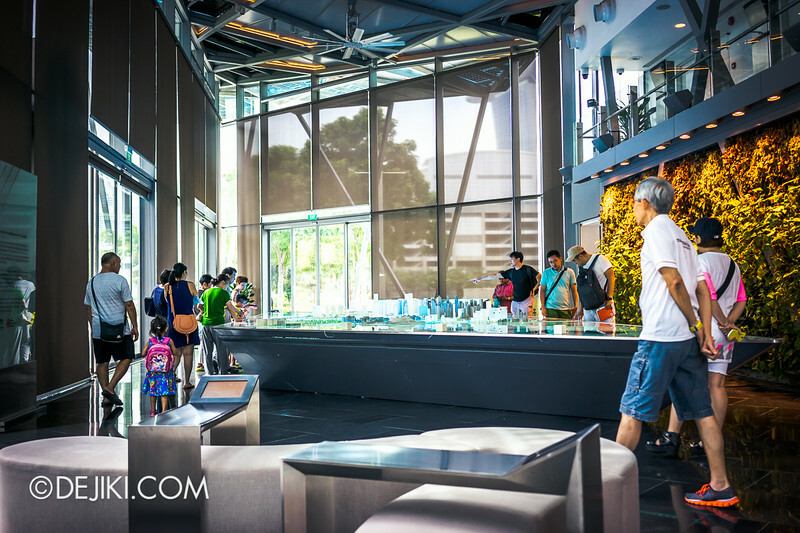 While the Marina Bay Waterfront is no stranger to me (there’re regular updates on Gardens by the Bay on Dejiki.com, and Marina Bay Sands is one of my favourite malls), exploring key attractions on wheels is definitely novel and exciting. Our tour began at the Marina Bay City Gallery. Upon registration, my sister and I were presented with an iPad showing the Segway safety video. 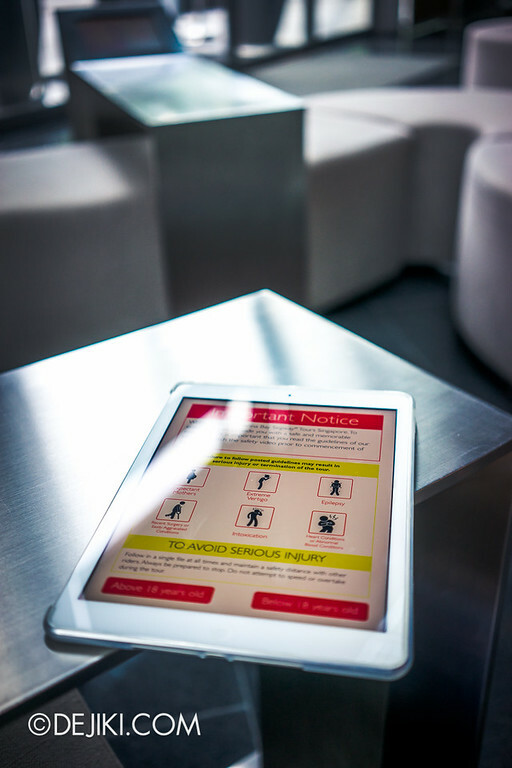 It went over safety guidelines on using the Segway… and how to avoid injuries. Common sense stuff, like ride down a steep slope. The stick figure animation did give us a few laughs, though. There are two types of tours offered here. 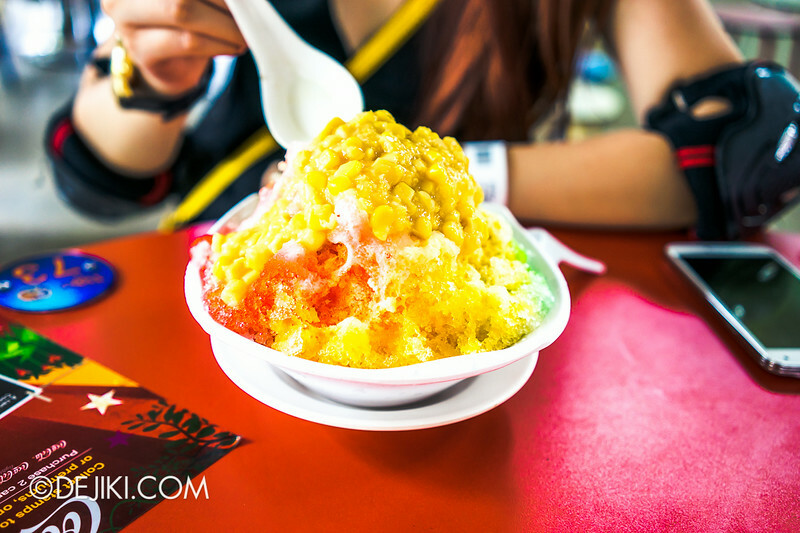 We got to experience the Signature, which is a 120-minute tour that goes all the way to Marina Barrage. We then got out and put on safety gear: Helmets, elbow and knee guards. And then we stepped on our Segways. 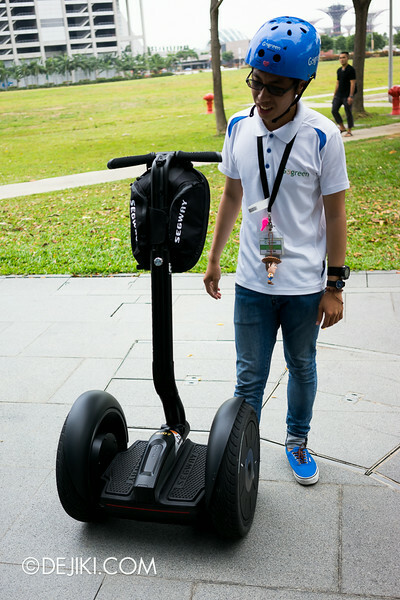 The Segway i2 PTs are used for the tours at Marina Bay. Gentle learning curve and a breeze to use, after the first five minutes, that is! We couldn’t leave the “training zone” until we got the basics. The trick is to relax and just tilt forward gently. We thoroughly enjoyed the tour not only for the novelty of gliding along Marina Bay on Segway PTs, but also because how professionally the tour was conducted. Our tour was facilitated with Anna (tour guide) and Jeff (safety officer). Throughout the tour, the duo kept us entertained with many fun facts about Marina Bay and some slick Segway moves. Jeff made sure that the paths were clear for us to traverse – the route is often filled with packs of cyclists and joggers. There is certainly a lot to learn about Marina Bay, even if you’re a local. Even while we were at the Promontory, Anna highlighted some of the skyscrapers, nightlife hot spots, as well as historic buildings that were still around. While such transporters have been around for many years, we attracted many onlookers during our tour. They all asked about renting the Segways for personal use. For now, the transporters are available at Marina Bay for scenic tours only. It’ll definitely be a challenge taking photos while riding the Segway PTs, but fortunately I still brought my A7 along. Anna and Jeff helped us snapped photos at some of the stops. If I had a GoPro, I might attach it on the Segway’s handlebar. We had a short break at Satay by the Bay after the Marina Barrage stop. Time for desserts! After we stepped off the Segways, walking felt like a chore. Immediately, we missed the ability to just glide along the streets. One day perhaps, when such transporters become truly portable, we’ll all be zipping about. 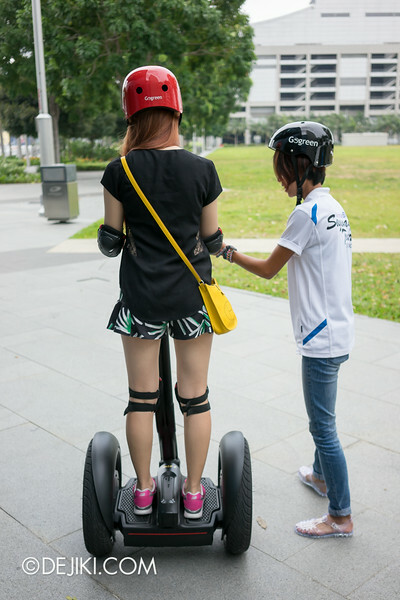 For more information and booking enquiries, visit Segway Tours Singapore. Special Thanks to Marina Bay Singapore for inviting Dejiki.com to experience the Marina Bay Segway Tour.